talkhealth > Blog > 2014/10 > Alcohol Concern release an 'Alcohol Harm Map' as part of latest alcohol awareness campaign. Ever wondered about the greater implications of excessive alcohol consumption? 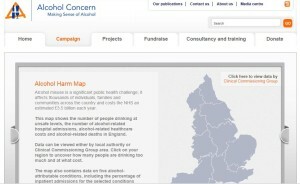 Today Alcohol Concern has released an Alcohol Harm map as part of their campaign to increase awareness of alcohol use. Interestingly this campaign allows people to look directly at their local area where they will find statistics showing the number of people drinking at unsafe levels, the number of alcohol-related hospital admissions, alcohol-related healthcare costs and alcohol-related deaths in England. Perhaps this new initiative will make people aware of the greater implications involved when people drink to unsafe levels and not just the personal effects on individual health. The map also contains data on five alcohol-attributable conditions, including the percentage of inpatient admissions for the selected conditions attributable to alcohol as well as their associated costs. ‘Alcohol misuse is a significant public health challenge; it affects thousands of individuals, families and communities across the country and costs the NHS an estimated £3.5 billion each year. Click on the image to take a look at the Alcohol Harm Map and discover more about your area.